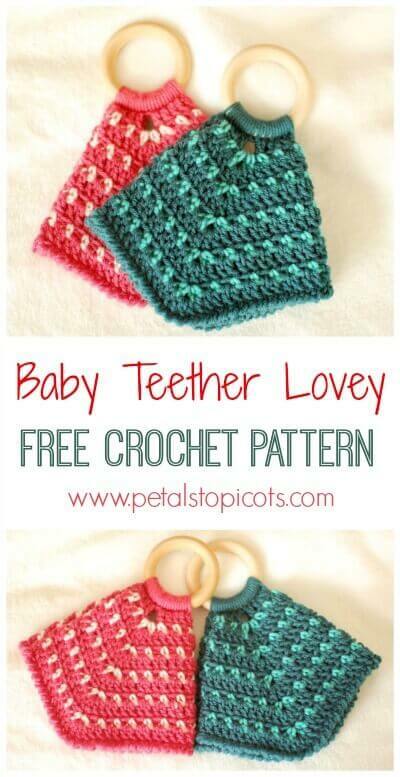 This teether lovey crochet pattern is not only cute and cuddly but will help provide much needed comfort and relief for teething babies. The blanket body makes it easy for baby to grasp and hold. This lovey is the perfect gift for any new mom and baby and is fun to make for your own little one. 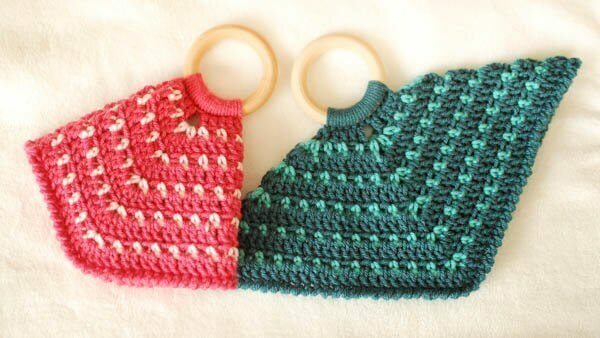 Gauge: 14 double crochets and 7 rows = 4 in. *Make sure teether is nontoxic and meets all child safety regulations. 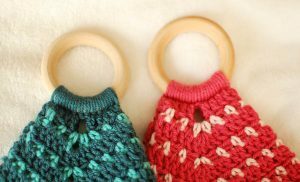 If using a wooden teether, choose an unfinished, untreated, all natural wooden ring. Please note that as with all handmade toys, this lovey should be checked regularly for pulls or unraveling that may pose a hazard. As always, infants and small children should be supervised. Notes: Work through both loops throughout unless otherwise noted. 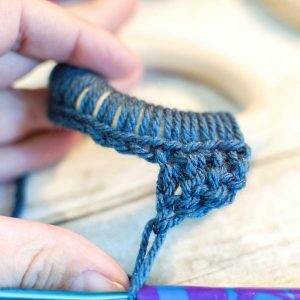 Work over yarn tails and weave in ends as you go. Setup Row: With CA, work 11 scs around ring, turn — 11 sts. To work around ring, begin with a slip knot on your hook. 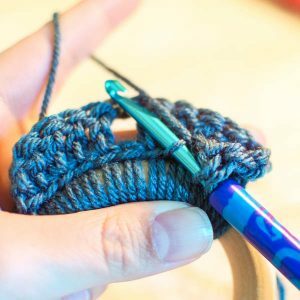 Keeping the working yarn behind the ring, bring your hook to the front, insert your hook into the ring and grab yarn from behind and pull up, yarn over and pull through 2 loops on hook (first single crochet made). Continue working into ring for a total of 11 single crochets. turning now and working back across unworked loops of single crochets from setup row, work 1 dc in each of the next 5 loops, ch 2, skip next st, work 1 dc in each of the next 5 loops, ch 2, join to beg ch, fasten off — 20 sts and 4 ch-2 corners. Round 2: Join CB in any ch-2 corner, ch 1 (does not count as st), *work [1 sc, ch 3, 1 sc] in corner ch-sp, ch 1, work 1 sc in next dc, ch 1, skip next st, 1 sc in next, ch 1, skip next st, 1 sc in next, ch 1, rep from * three more times, join, fasten off — 20 sc, 16 ch-1 sps, 4 ch-3 corners. Round 3: Join CA in any ch-3 corner space, ch 3 (counts as st), work 2 dc in same corner space, *work 1 dc in each sc and ch-1 sp to next corner, work 3 dc in corner, rep from * two more times, work 1 dc in each sc and ch-1 sp to end, join in beg ch, fasten off — 48 sts. Round 4: Join CB in the 2nd dc of any corner 3-dc group, ch 1 (does not count as st), work [1 sc, ch 3, 1 sc] in same st, ch 1, ** *skip next st, work 1 sc in next st, ch 1, rep from * to next corner 3-dc group, work [1 sc, ch 3, 1 sc] in 2nd dc of 3-dc group, ch 1, rep from ** two more times, join, fasten off — 28 sc, 24 ch-1 sps, 4 ch-3 corners. Rounds 5 through 10: Repeat Rounds 3 and 4 — each odd row increases by 16 sts. Round 11: Repeat Round 3 — 112 sts. Round 12: Working back across sts just made, work 1 rev sc in each st around, join — 112 sts. 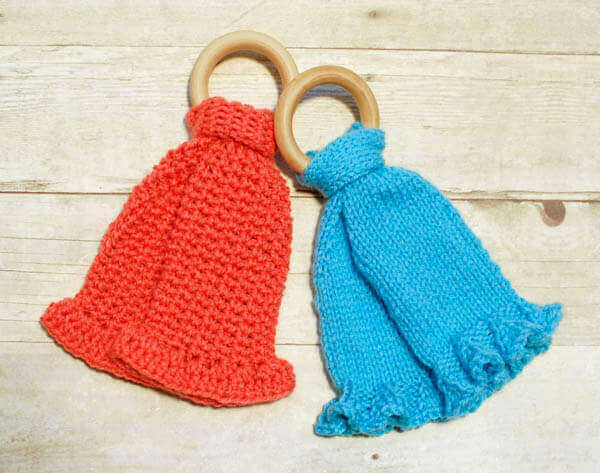 Check out my other teether lovey crochet patterns. 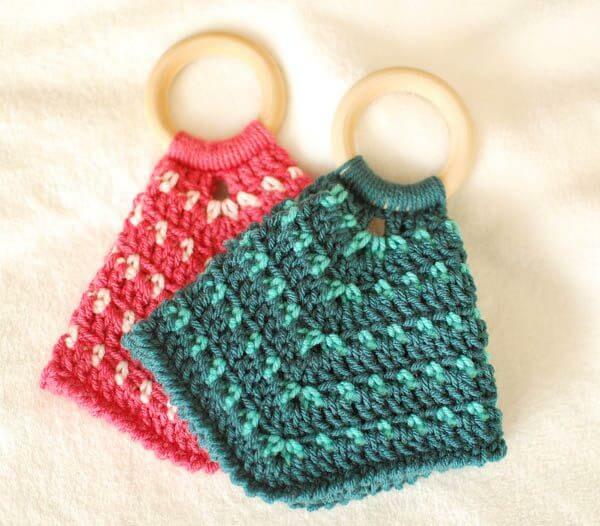 Click here for the crochet pattern. Click here for the knit pattern.